Embracing the trend to make small, compact cameras that are exceptionally powerful, Novoflex has released a correspondingly-sized CASTBAL Tilt/Shift Bellows Attachment Set, available here for Leica S-series cameras. The system is designed to support full-frame 35mm, APS-C, and medium format cameras and can be easily set to work with a different camera mount by simply swapping out the adapter. Its huge benefit is an impressive 25° tilt both left and right and shift within the quick release mount of the focusing rack. This rack is also Arca-type compatible. Ensuring proper focusing from infinity to an impressive 1.2x magnification on full-frame sensors is a specialized Apo-Digitar 90mm f/4.5 lens from Schneider Kreuznach. This has a large area of coverage to support tilt and shift functions and comes with all necessary accessories for operation as well as a lens hood to prevent flare. 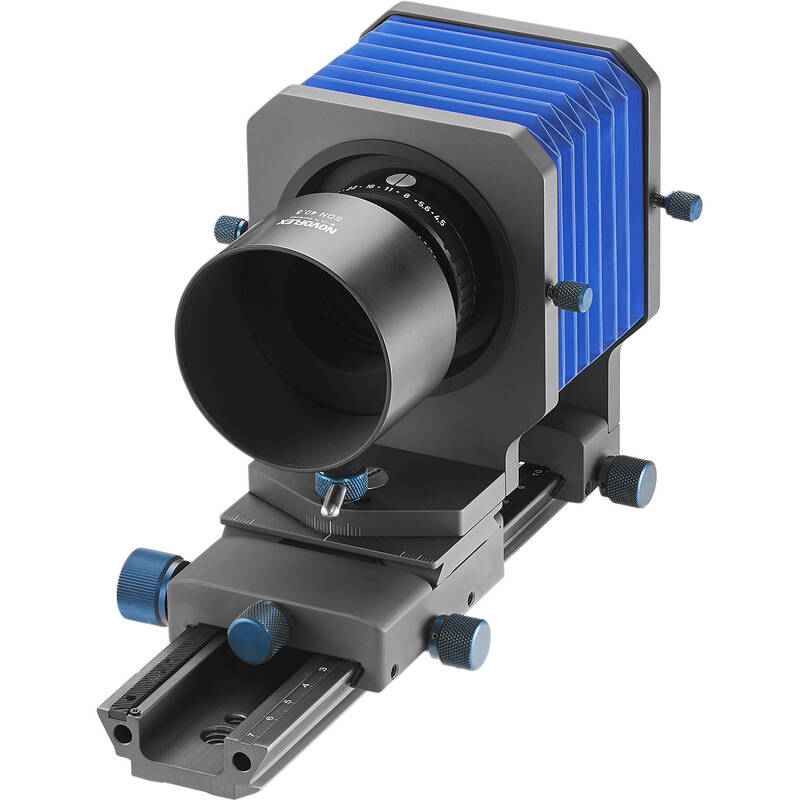 The Castbal Tilt-Shift Bellows Attachment from Novoflex is a compact bellows attachment that can be used with most DSLR, mirrorless and medium format cameras to create a Tilt-Shift system, ideal for macro photography and other applications. The bellows, in combination with the Castel-Q macro focusing rack and various Novoflex camera and lens adapters, attaches to your camera at one end and to a lens at the other to provide the extension and movements necessary for effective Tilt and Shift macro photography. Its maximum extension is 4.72" and its minimum extension is 0.9". The lens panel can be adjusted 25° to the left and right and you’ll be able to shift it within the quick-release mount of the focusing rack. Metal thumb screws hold the lens and camera adapters in place. The 90mm f/4.5 Apo Digitar Lens with Adapter Board from Novoflex fits the CASTBAL T-S bellows system which enables tilt and shift view camera movements utilizing DSLR and mirrorless camera bodies. The 90mm lens, which is optimized for digital cameras, provides focusing ranges from infinity to 1.2x magnification with 35mm cameras and up to 1.8x magnification with APS-C cameras. The lens is preassembled with a Novoflex adapter board to fit the CASTBAL system. The Apo Digitar 90mm lens is designed for digital backs and is ideal for shooting with smaller format cameras such as DSLR and mirrorless due to its extremely fine image circle that can concentrate the image on the relatively small sensor in a full frame or APS-C sensor. Its image circle is a constant 90mm throughout the aperture range, including at f/4.5. The lens' small rear barrel with minimal flange allows its use on a variety of cameras. 90mm f/4.5 large format lens optimized for digital sensors with 90mm image circle throughout aperture range and short rear barrel. With preassembled adapter board included, this lens fits CASTBAL T-S bellows system. Capable of focusing to infinity while matched with full frame or APS-C DSLR or mirrorless cameras. This Lens Hood from Novoflex is designed for the Schneider Kreuznach Apo-Digitar 90mm f/4.5 lens equipped on many universal bellows systems. It helps block stray light form entering the lens and is available here as a replacement part for the one originally included with the optic. The Adapter for Novoflex A-Mount to Castbal T/S Bellow from Novoflex allows Novoflex A-mount rings to be attached to the Castbal Tilt-Shift bellow for use in the Castbal Tilt-Shift system. Specific A-mount rings then attach to select DSLR and mirrorless cameras enabling DSLR and mirrorless cameras to have enhanced macro and tilt-shift capabilities when used with the Castbal T/S system. The Novoflex Adapter for Castbal T/S Bellows Attachment to Leica S-Mount Camera allows you to use a Leica S-mount camera with the Castbal T/S bellows unit. Box Dimensions (LxWxH) 5.8 x 4.8 x 4.1"
Box Dimensions (LxWxH) 11.5 x 6.3 x 2.2"
Box Dimensions (LxWxH) 3.75 x 3.75 x 1.5"